rtulip.net » Cut Emissions Or She Gets It! 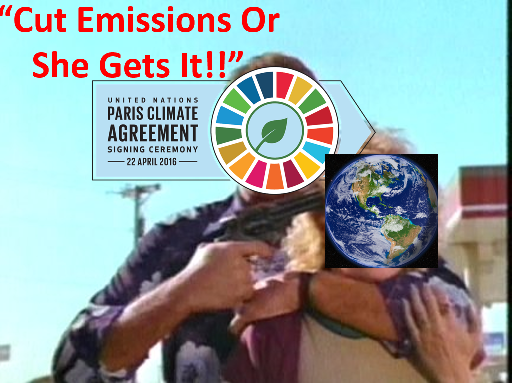 Cut Emissions Or She Gets It! The challenge posed by this new IPCC warming report is to intrude an authentic ethical perspective into public conversation about the existential realities of climate change. Unfortunately, the IPCC report is morally bereft on several points. Its key message is moral blackmail – decarbonise or the planet gets it. The alternative strategy, immediate focus on cooling through Solar Radiation Management coupled with massive research and development of Carbon Removal, is ignored and belittled. The IPCC simply refuses to discuss the risk-reward analysis of this alternative strategy for political reasons, regardless of the scientific evidence. Seeing the horrendous damage from Hurricane Michael makes me deeply angry at the inability of the political system to engage with the urgent need to cool the ocean to deal with the symptoms of global warming. The medical system does not say to patients ‘just put up with the symptoms to give us a moral incentive to find a cure.’ But somehow that immoral line is accepted when it comes to the immense global problem of climate change with its consequences of extinction, hothouse earth and other grave risks. A range of geoengineering technologies including marine cloud brightening and newer ideas on iron salt aerosol could cool the waters of the Caribbean and Atlantic to reduce hurricane intensity. Where is the insurance industry in engaging with this major damage factor in its actuarial risk projections? The political strategy of shifting from fossil fuels to renewable energy should be an important component of climate action, but instead in this report the demand to cut emissions drives and corrupts the entire logic of the IPCC argument, leading to a series of false claims. The morally coherent path, prevented by UN politics, would instead be the scientific approach of weighing the evidence for feasible alternative options. That is excluded because it would reduce the political pressure for decarbonisation of the world economy, regardless of feasibility, safety and efficacy. The Summary for Policy Makers opens with an egregious blunder, saying (A2) “warming from anthropogenic emissions from the pre-industrial period to the present will persist for centuries to millennia (high confidence).” This mode of thinking is so pervasive that its falsity just gets ignored. As stated, it logically excludes the possibility of carbon dioxide removal and solar radiation management at scale sufficient to end the persistence of warming from previous emissions. The report should include the caveat ‘unless methods for carbon removal are developed.’ No such caveat is applied to the categorical high confidence of its false assertion by the IPCC. Their unstated reason is that UN politics sees the war on fossil fuels as the only climate strategy, and censors from view anything that could cause hazard to the decarbonisation approach. Unfortunately, this recipe for political conflict against the current economy will leave the climate and our grandchildren as the losers. While we bicker over the alleged immorality of climate restoration, and governments such as the US, Brazil, China, India, Australia and Russia continue to drive ever higher emissions, ignoring climate science, the peril of a hothouse security catastrophe grows by the day. 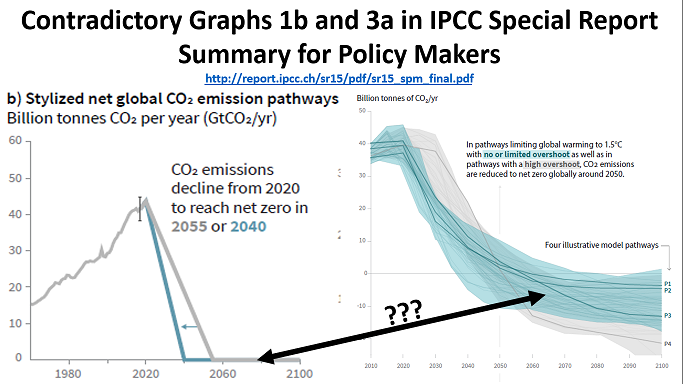 The muddled thinking in the IPCC Summary is reflected in its blatantly contradictory graphs Ib and 3a. Fig SPM 1.b is titled Stylized net global CO2 emission pathways. It presents emissions growing to 2020 then a linear fall to “net zero” by either 2040 or 2055, followed by a flatlining at zero over the next century. As I have pointed out at HCA before, the absurdity of this “net zero” concept reflects its pure political origins. Net zero means positive emissions are exactly balanced by an equal amount of negative emissions, removing carbon from the air. But negative emissions could be a lot bigger than positive emissions, so the stylised straight line of exactly net zero emissions after achievement of a decarbonised new world is absurd. If net zero is good, then net negative is far better, and indeed essential to remove embedded warming. But Figure 1b ignores this simple logic. The Net Zero graph 1b is contradicted at Figure SPM 3a, which corrects the absurd flatlining involved in net zero thinking by showing the moment of Net Zero as followed by Net Negative emissions of up to 20 GT per year. It shows the toxic politics of the IPCC that these contradictory graphs could survive its alleged rigorous peer review process. The real issue behind this absurdity is the failure of IPCC to advocate to governments for least cost abatement, which would shift funding from renewable subsidies to CDR R&D. This IPCC dismissal of SRM is a purely ideological position, calculated to minimise political opposition to emission reduction by wrongly suggesting there is no alternative. SRM advocates can easily see that SRM alone is not sufficient to stabilise the climate, and only propose SRM as critical to buy time to prevent dangerous tipping points while the optimal mix of CDR and emission reduction can be developed. Instead of such a practical approach, the IPCC just rules out SRM in order to support its gun at the head insistence on an immediate end to coal. Against the ideology of emission reduction alone, Ocean Pastures could be a least cost abatement strategy. Astoundingly, the Summary completely fails to mention ocean fertilization. And yet, it does point out at SPM C1.2 that cooling aerosols, now added to the air by iron-rich dust and fossil fuels, have mitigation effects that decarbonisation would reduce. Surely we should be looking at how to retain these important mitigation effects, especially if in doing so we can restore the climate at far lower cost than any other method of abatement?